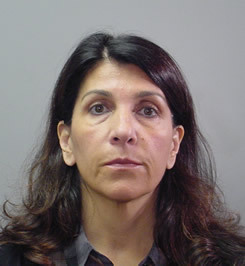 Nassau County District Attorney Kathleen Rice announced the arrest today of a Floral Park woman for stealing nearly $700,000 from a longtime employer, as well as more than $10,000 from a new employer by writing herself checks drawn from company bank accounts. Three counts of Falsifying Business Records in the 1st Degree (an E felony). Judge Watson set bail at $25,000 cash or bond. Tangredi faces up to 15 years in prison if convicted of the top charge. She is due back in court on Nov. 5. DA Rice said that Tangredi was employed by a Great Neck mortgage lender and realtor as an administrative assistant and bookkeeper for 17 years. Upon closing both businesses in November 2013, Tangredi’s employer began an audit going back to 2012. The employer obtained bank records and discovered that checks had been made from company bank accounts to pay Tangredi’s personal car loan, American Express, and Citi Card accounts. To conceal the theft, Tangredi altered the check register to reflect the name of the payee as someone her employer’s companies would do business with. After a subsequent investigation by DA Rice’s office going back to 2009, it was discovered that Tangredi altered over 100 checks totaling $694,244.41. DA investigators also revealed that Tangredi altered checks written from her employer’s business accounts to pay off her home equity line of credit. As a result of DA Rice’s investigation, it was discovered that Tangredi had deposited checks from her new employer, a law firm in Mineola. Tangredi stole a total of $10,387.33 from her new employer by forging signatures on checks, changing the name of the payee in the company’s ledger, and altering her employer’s bank statements. Assistant District Attorney Victoria Curran of DA Rice’s Government and Consumer Frauds Bureau is prosecuting the case. Tangredi is represented by Robert Schalk, Esq.